Google: Too Big To Fail? On Tuesday, Google made what was played up to be a huge announcement of new features. Search marketers feared they were in for another Enhanced Campaigns-type of blow; it turned out to be pretty benign. Talk on Twitter during the announcement was interesting, though. Google led off with a “history of radio ads” narrative that was boring and, frankly, off-topic – which drew jeers from the Twitter crowd. Then they talked about promoting apps – another underwhelming feature. Finally, they talked about some new bulk editing, experimenting, and reporting enhancements that look cool and truly useful. The final reactions on Twitter? Meh. Much has been said about what ended up being an overreaction by search marketers prior to the announcement. Some of it rubbed us the wrong way. I maintain that our fears were warranted, given the disruption caused by Enhanced Campaigns last year. But what struck me about the announcement is the fact that Google led with apps, as though this was the big thing that advertisers really cared about. Based on my own needs and the chatter on Twitter, they’re wrong. I don’t have a single client who wants to advertise apps – in fact, I don’t think I have a single client who HAS an app. So why was Google pushing apps so hard? Ever heard of Google Play? Google is creating products that will serve their interests – not their customers’ needs. They’re headed towards a slippery slope. The new reporting features also indicate that Google thinks they are bigger and better than the bid management and reporting platforms. Yet another slippery slope. When companies start to believe they’re above the rules, they start walking into “too big to fail” territory. When companies think that “all your data are belong to us,” they start walking into “too big to fail” territory. When companies tout a huge “announcement,” only to push something that 90% of their customers don’t’ need, they start walking into “too big to fail” territory. So what do you think? Is Google too big to fail? Are they oblivious to the needs of their customers, the advertisers? Were we fools for being concerned and worried about the announcement? Or did the announcement give you pause? Share in the comments! Good post – I too was underwhelmed – although pivot tables in Analytics and draft campaigns as experiments are very cool. However, clients don’t really care too much about the tools we have to do the job, they care about how the job looks when it’s done. In terms of Google being too big to fail I have a couple of comments – firstly, you are right, Google do seem to be pushing marketers to use their platform the way they want us to use it – not the way we want to. Keep doing that and we will find an alternative – there isn’t one as yet – at least, not one which can offer the volume – but we might not be looking for volume in the end. Pushing us to advertise on tablets and mobiles (or desktops for that matter) when we don’t want to is a mistake (in my humble opinion). Like the kid who owned the bat an ball in the local park – he makes up the rules, but if he is snotty about it – in the end he plays alone. My other comment is that Google might be too big to realize they are failing – and I can envisage a future point where this does happen and they don’t see it until it’s too late. If someone shouts out “the Emperor is naked”, what happens then? Great points, Steve. I think the emperor has been naked for a while, but he’s still emperor at this point. I’m still rooting for Bing to make a real run at Google. Time will tell. You know I totally agree with you on this – especially after my two most recent posts on the topic:). Google would really do well to get a fresh perspective from someone who is not “drinking the kool-aid” so to speak. When organizations reach a certain size or level of market dominance, they almost always lose site of continuing to serve their customers. It can become a lot more about doing what they want and forcing it down everyone’s throat. Take Microsoft as a great example too. They had similar market dominance and through a series of ill-conceived and some would argue incredibly arrogant moves, they are not the juggernaut they once were. All that being said, as paid search pros, we certainly have a very specific point of view and set of opinions as to what Google should do. I certainly don’t expect that they will do everything we’d like, but it would be nice if they were smart and humble enough to avail themselves of the many outside experts and regular people who use their services to TRULY get a sense of what people actually want. If they keep treating us as if they always know best and we just don’t get it yet, they will end up like Microsoft – still a strong company, but one that is viewed as being out of touch and chasing the market leaders (currently Google or Apple). I tried to get as much info. as I could about this set of announcements, and all of them told me I wasn’t going to be mad. I am totally open about sharing my distrust with them and they didn’t want to get a ranting phone call as soon as it was over. So that’s a step in the right direction. I think we just have our guard up, which we should continue to do so. Caveat emptor! Interesting insight, Lisa. The mere fact that they were surprised that we were upset about Enhanced Campaigns tells me how out of touch they have become with their customer base. That certainly wasn’t the case 10 years ago. But should we be surprised? Outside of Larry Page and some of the old guard advisers, most Googlers probably had fairly modest ambitions early on. Perhaps they were naive about their own company. Flash back to when Google not only didn’t have an Analytics product, they *did not have tracking code* for AdWords. Third party products with tagging were all that existed. We adopted ConversionRuler because the company was nimbler than some of the older products on the market. So on a tour of the Plex, I asked whether Google was considering getting into this area. Sheryl Sandberg told me: “We at Google tend to feel that third parties are better at specializing in those kinds of products & services, so we don’t have any plans to move into that area currently.” We’re talking about dropping a cookie here! And they were tiptoeing around, or didn’t even have it on their radar. I don’t think they feel that way, ever, but I do miss the days when some Googlers respected limits and boundaries instead of wanting to move into seemingly every industry. We used ConversionRuler too; I liked them a lot. But when pricey Urchin became “free” that was HUGE news. Fast forward nearly 10 years, and we’re talking about campaign mgmt and bid mgmt tools. Goliath just entered the competition for those who “only have budget” to buy Google. Exactly what I was thinking. I remember building our own analytics system when I was in-house in the early 2000s so we didn’t have to pay Urchin’s prices. And then boom, it was Google Analytics and it was free. Crazy how much things have changed – and continue to change. Hi Melissa & thanks for the commentary on the new stuff. I did sign up for the webinar thinking I MIGHT attend, but given I am in Australia, I think it was on at 2am or something equally silly so I decided not to bother showing up. VERY glad I didn’t after I read what they discussed the next day. My response was “underwhelmed” like everyone else. As for google becoming arrogant and ignoring users, sadly that’s been the case for some years now, although it seems to have gotten worse in the last few years. I too wish there was a solid alternative (in Australia, bing/yahoo are very minor players) so I could either ditch Google or at least not have to lean so heavily on them. Sadly, there isn’t. Facebook is the closest but they still have a long way to go to be a SOLID alternative to someone seeking leads for my line of biz. Having said that, I am endeavouring to “crack the code” on FB so I can move $10K+ from Google to them in ad spend each month, just to ensure I am not locked into the big prison that is adwords. Hi Eran and thanks for your comment! I’ve also found with our international clients that Bing really is a non-player outside of the US and Canada. It’s even more unfortunate for those outside North America who are stuck with Google or else. I do think that social PPC, for the right advertiser, is a great option. Facebook seems to be global; it’s a great alternative to Google if you can get it to work for you. Thanks for your perspective – love hearing it! As usual, another stellar blog posting. On your birthday, no less. Yay fabulous post! I know I’m rather late to replying to it, but it’s been very interesting to read the follow-up comments. 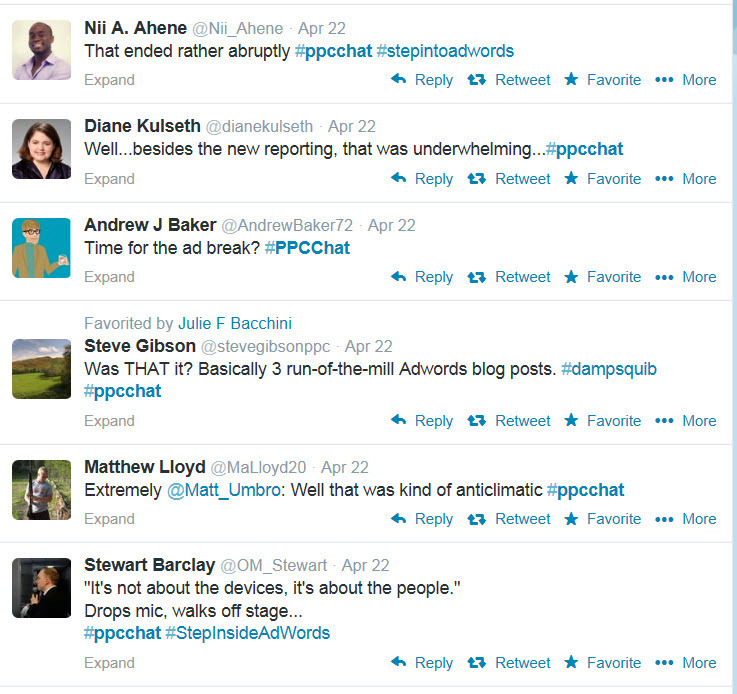 I’m amazed that Google were surprised at our reaction to Enhanced Campaigns. Our Google reps certainly weren’t surprised and spent a long time talking us through everything and ensuring that we knew the benefits too. I’m not particularly excited about any of the new announcements although the revamp of ACE will be interesting to have a play with. But as an avid Marin/Excel user, there’s nothing in it for me – we don’t have an app, so that aspect isn’t relevant.